SufferingÂ from “battery electric vehicle range anxiety” this holiday season? We at “Drive…He Said” picked up a “half-witted” key to a 2013 Volkswagen Passat TDi, to evaluate what might be the perfect antidote. Â What better way to combat our own anxiety than by taking the high road to that “Birtplace-of-all-Passats” in Chattanooga, Tennessee. Â In days of our youth Chattanooga was the un-official “half-way point” on spring-break trips to Clearwater, Florida. Sure, it also happens to be known for the “Choo-Choo” and a fateful American Civil War battle. Even though we usually stayed overnight in Nashville (oops). Just north of this picturesque city of 170,000, straddling the Tennessee River, is where the Passat TDi was born.Â With an EPA highway fuel-economy rating of 43 miles per gallon, “just” 620 miles to drive from Chicago, and a generous capacity for 18.5 gallons of diesel on-board there should be ZERO fuel stops. If only the human bladder had such capacity. Â Inside and Outside the Volkswagen Chattanooga Assembly plant: Â One-point-two million square feet of gleaming buildings are nestled in over a thousand acres in the foothills of the southern Appalachian Mountains. Hard to believe that the Volkswagen Chattanooga Assembly plant resides on land reclaimed from a former explosives manufacturing site. Outside there is an abundance of white-tail deer either frolicking or “mowing” the natural grasses. The wind whistles through the leaves of the legions of oak trees which span the entire horizon. They all seem oblivious to the 3000 humans inside the assembly plant who along with some 380 robotic arms and welders finish 600 new Passats each day. One out of every five of those Passats is a diesel TDi model. Â Watching the robots effortlessly fire off nearly 5000 pin-size laser welds confirmed our seat-of-our-pants observations as to the high-build quality of the Passat TDi. The assembly line moves at a relaxed pace, such that if a worker detects a flaw along the way a car can be pulled for further inspection. If a defect can be remedied then it gets re-introduced to its siblings. If not, it gets torn apart for inspection. In one morning, out of 300 cars being produced; we witnessed two non-conforming units pulled off the line. With one repaired to be re-introduced the other was to be torn down for further examination. Â Who said only cars have to exemplify sustainability?. The nation’s only LEEDS Platinum certified automotive plant, with its impressive run-off water reclamation system, will soon obtain 12% of its electricity from an adjacent 33,000 panel solar field. How the 2013 VW Passat TDi took to the hills of southeastern Tennessee: Â Seven-miles of steeplechase-styled driving loops await in Hamilton County’s 2800 acre Enterprise South Nature Park. Just turn right as you enter the Volkswagen Drive roundabout (or left if exiting). 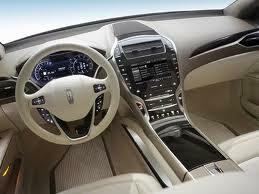 It’s here where drivers realize another beauty: that of low engine speed torque inherent with diesels. Not that we minded depressing the light clutch and stirring the easy to row shifter of the 6-speed manual transmission in our “Candy White” tester. This, despite the fact that clutch and brake pedals are canted too far right. Caught napping in a high gear by a switchback that rises steeply? Forget about downshifting in the Passat TDi. Just push the accelerator from as low as 1200 r.p.m. and feel nearly all the 236 pound-feet of twistÂ tugging at the 3300-pound Passat’s front wheels. Observe the small Atkinson-engine supplemented electric hybrids wheezing just to catch up. It’s all developed by a single cam 140 horsepower 2.0-Liter turbocharged inline 4-cylinder, with iron block and aluminum cylinder head. 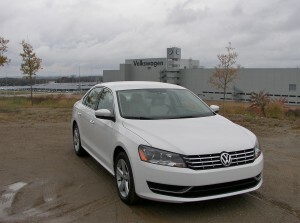 As a family vehicle, the VW Passat TDi acquits itself pretty well. The interior dimensions are on par with some full size sedans, withÂ the rear seat’s 39″-inches of legroom matching that of the Chrysler 300 sedan. With the added benefit of a reduced middle transmission hump, a 6-foot tall adult in the middle position has little reason to complain in the back-seat of the Passat TDi. Three full sized leather trimmed Hartmann suitcases will luxuriate in the 17-cubic foot trunk, with fold down access to the cabin. As Teutonically intuitive, logical and legible the controls and displays are, the Germans in Wolfsburg have clearly imposed austerity measures on this second model designed for Americans. We’ll protest the austerity in the 2013 Passat’s un-lined glovebox, the hard plastics on the door panels and the arm-rest which no longer slides forward. The tall, sharp edges of the center console are not a comfortable place to rest a knee. And there’s that rotary headlamp switch that has but two positions: Daytime Running Lights and On. Tight window seals and good aerodynamics exclude wind noise from the cabin. Lower amounts of insulation elsewhere amplify the sound of liquid (fuel? AdBlue?) sloshing out back, something the flat sounding base audio system cannot overcome. Priced at $27,000, that our stripped SE was, at least Volkswagen doesn’t deny any Americans heated front seats. Â Exterior styling struggles to be formal but is hardly expressive, much in the way that a solid black suit is in dire need of stripes (and we don’t mean “pinstripes”). If you have ever been in the last German made B6 Passat, derived from the previous model of Audi A4, then you’d “comprende” what all the fuss is about. Â During more sedate in-town outings, the Passat TDi asks little of drivers or passengers. There is this care-free attitude. Pick up the pace on the wide sweeps in the valleys just outside Chattanooga, though, and the Passat becomes nonplussed. Meaning that the rapid steering rack is in need of feedback. Brakes, which are typically a VW forte, need a larger booster. And mucho body roll demands higher spring rates. Are we asking for a lot? This is the same company this gives us Golf Rs…not to mention Veyrons, Aventadors, Continental GT Speeds and 911 GT-3s. The Myths about Diesel Costs and Emissions: Â Having descended LookoutÂ Mountain, the fuel gauge noted perhaps a gallon and a half of reserve on-board the Passat TDi at the 706 mile mark. Had we chanced it the Passat TDi would have run out at 800 miles. It would be our second and final fueling of the entire round trip. Settling on a service station featuring a prominent “Diesel” sign, we meandered around the “gasoline islands” until we saw a lonely diesel pump banished far and away, in the corner, as if isolated with a contagious illness. “So you say that diesel fuel costs 15% more expensive than regular grade gasoline.” With 40% lower fuel consumption than a comparable four-cylinder gas-powered family sedan, the net fuel cost to drive the TDi on freeways is 30% less. “What about gas-electric hybrids?” For now, expensive-to-replace batteries consume plenty of trunk space and dictate smaller fuel tanks. Is it just coincidence that for the same money Kia now assembles its Optima Hybrid model less than 200 miles away in West Point, Georgia. Call it fodder for another pilgrimage. Fuel Mileage Results may “Vary Greatly”: Â Ordinarily, here at “Drive…He Said” we aren’t the sorts to brag. But you should have seen us make believers out of a small gathering that toured the VW Chattanooga plant along with us. “What? You said 46.5 miles per gallon averaging just under 80 miles per hour? Without hypermiling? While passing on the steep inclines on Interstate 24 west of town? And your TDi ran 710 miles on 17 gallons of diesel fuel before the “driving on fumes” warning light came on?” In urban slogging the Passat TDi returned a more earthly 34 mpg. Â So, come on America. Do diesel pumps really deserve to be so lonely? For the first time in seven years, Ward’s List of the top-ten best car and truck engines is wholly comprised of gasoline-powered engines. 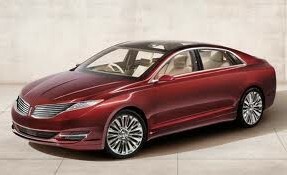 No hybrids, all electric or diesel powertrains on the list for 2013. Because Wards judges found significant innovations in fuel efficiency and overall refinement in the traditional gasoline engines that power the majority of vehicles,Â the alternative engines weren’t included. Outside temps have already started their wintry descent. As traffic races a fresh splash of road salted slush smacks the middle of your car’s windshield. Instinctively you activate your the windshield wipers. As the wiper arms move to and fro the result is smeared rather than cleared glass.Â More aggravating is the chatter which isn’t caused by your pearly whites. Some “Do-It-YourselfÂ TLC” is in order for you car / truck / van.Â Do some holiday shopping for your ride at the nearest auto parts store, general merchandise store. Or simply let your fingers do the on-line walk to pick out a pair of new windshield wiper blades. Its nice to know that many brands even offer rebates available during the late fall and early winter. You say you’re almost positive that you swapped out the wiper blades last year? Or that a yours are the more expensive integrated-frame “beam-style” blade fitted to many newer cars today? Even that the rubber is advertised to be made of silicone or have a Teflon coating? Besides you can’t see any major tears or rips in the wiper blade. Well, exposure to the sun’s UV rays still breakdown the fanciest rubber. Ditto the heat and cold. As do the ozone, exhaust, pollution, road grime and road salt.Â For verification roll the rubber portion of the wiper blade in between your fingers. If the rubber appears glazed and lacks real pliability, the blades are goner’s. While the traditional exposed frame wiper blades accept rubber refills, over time the metal springs tend to bind or corrode and the surfaces will discolored. In the end all -new wiper blades are going to be the simplest to install. When selecting replacement wiper blades be sure to match size and connector-types. Walk-in retailers will have a catalog next to the display that will provide the dimensions for your vehicle’s application. Online-retailers allow consumers to complete drop-down boxes which will generate the lengths. Keep in mind that it is not unusual for the driver’s side wiper blade to be different in length from the passenger side. Confirm the size by pulling a measuring tape. Prior to installing carefully read the diagram on the packaging. Even if the text instructions are pretty sparse. Ascertaining the type of hook on the wiper arm will permit you to select the appropriate adapter, as two are typically supplied. Some final tips when its comes to windshield wiper blade maintenance: Always change wipe blades in pairs. Remember, rear windshield wipers included on many wagons and SUVs also need the same attention.